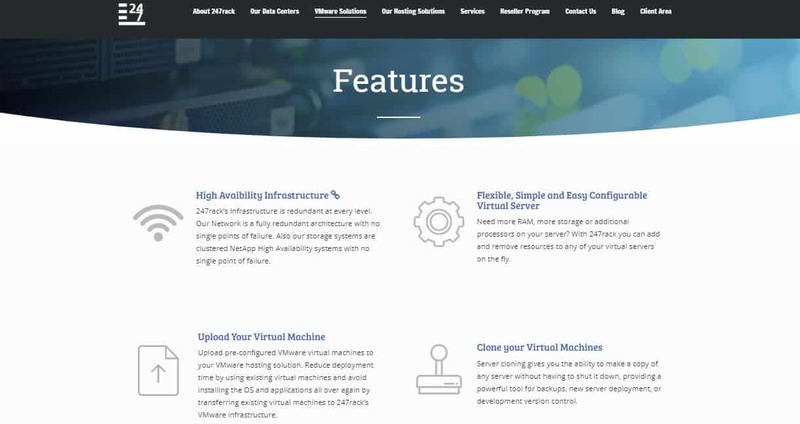 247 Rack Review 2019: Is 247 Rack a Good Hosting? 247rack is a U.S. hosting company with data centers in several locations in the United States and Canada. This hosting provider targets mainly mid-sized and large corporations, primarily in North America and Europe. It has more than 2500 deployed servers that host the websites of more than 560 businesses. 247rack offers a number of hosting-related services including VMware cloud solutions, colocation services, dedicated servers, business continuity, server consolidation, and virtual desktop solutions. The company does not offer shared hosting services. Unlike most other vendors, 247rack allows customers to use their own hardware that can be shipped to, installed in, and managed at the vendor’s data centers. 247rack uses a fully redundant network architecture at every level, with no single points of failure. You can upload your preconfigured virtual machine to their VMware hosting platform, and have access to their VMware virtual machine console through which you can install, modify, and repair your virtual machine’s operating system. They have also simplified the processes of configuring, upgrading and downgrading your servers. You can increase CPU, storage resources, memory, and performance with ease without incurring downtime in the process. 247rack has a time-tested 100% uptime, making it extremely rare to hear stories of downtime from customers who use their services. However, it is important to note that if the vendor suspects illicit or malicious software running on its VPS servers, they can quarantine the servers and filter them one-by-one looking for the malicious software. While these events are extremely rare, and you would get at least an hour’s warning, your server could be shut down for as long as ten or more hours. It’s the company’s way of avoiding network-wide problems if a malicious program infects the system. While the basic prices of 247rack’s hosting plans look attractive, the costs quickly add up as you add essential features such as the control panel and the operating system. Packages also exclude the external site/server monitoring solution and the remote server control feature, for which you must pay extra. The basic VPS package comes with 1-8 cores, 1 GB RAM, 50 GB hard disk and 500 GB bandwidth. The premium package takes RAM up to 3 GB, hard disk storage up to 70 GB, and bandwidth up to 700 GB. This looks good until you realize that the premium plan does not include SSD storage, control panel, level 2 managed backup protection, or software licenses of any kind. You have to bring your own licenses or pay extra for the vendor to provide them. You can contact 247rack’s 24/7 technical support via a toll-free telephone number, email, ticket or live chat. You can expect rapid responses and the technical expertise to resolve almost any issue you may have. The only negative is that sometimes I have found them to be a little impatient and impolite. If you’d prefer to support yourself, you will find more than 370 VMware articles and hosting tutorials in their knowledge base. 247rack hosting solutions are without a doubt powerful and reliable, but to make the most of what they have to offer, you must be willing to spend a substantial amount of money. Therefore, this vendor is best suited to large corporations that won’t mind spending more money for higher performance, 100% uptime, and all-round reliability. Wondering how 247 Rack stacks up against other Web Hosting companies? Enter any other Web Hosting company and we will give you a side-by-side comparison.